Just some of what I found in the books on my bookshelves. The pesto pinwheels and cheddar cheese puffs were marked “good.” The beef and nectarine stir-fry? “Not so great.” Underneath the banana cake recipe was a note that read: “12/28/91 very good bread.” And underneath the eggplant dip: “Put eggplant in a collender for 1/2 hour with a heavy object on it so the juice can be extracted from the eggplant.” The penciled messages are hidden cues to which foods I should cook and those that I should stay away from, little helpful hints from Mom. “A Book of Common Prayer” by Joan Didion: “… We’re all drifting separable golden leaves like little toy boats on the pools in the streets, drifting down and ocassionally touching. ~Lisa.” Dated May 8, 1977, on the inside of the front cover. “Divine Secrets of the Ya-Ya Sisterhood,” by Rebecca Wells: “Friends forever!” signed by author Rebecca Wells on the inside front cover of this used book. Not dated. “To Kill a Mockingbird,” by Harper Lee: My press pass from when I covered the CNN/YouTube debate. I forget about that press badge! “Becoming a Writer,” by Dorothea Brande: A discolored bookmark from Toronto Women’s Bookstore on 73 Harbord Street in Toronto. “Why a Daughter Needs a Dad,” by Gregory E. Lang: “To: Mallary. From: Dad. So much of this book reminds me of us. <3” Dated Christmas 2006 on the inside of the front cover. 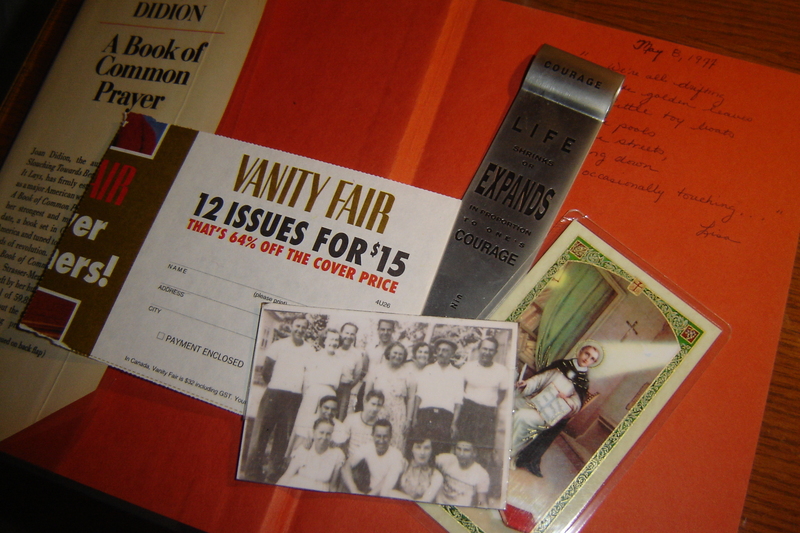 “The Digital Photography Book,” by Scott Kelby: The address of a friend who lives in Rome, N.Y.
“The Last Hurrah,” by Edwin O’Connor: A sheet of white-lined notebook paper with unknown names and numbers next to them. “Anna Karenina,” by Leo Tolstoy (A 1944 copy I found for $4.50! ): “This book is from the hoard of Marie Garher. Read thoroughly, handle carefully. Return promptly.” Not dated, on the inside cover. “Love: Quotes and Passages from the Heart,” by B.C. Aronson: “Mallary, life is all about love. May you enjoy all kinds of love throughout your life.” Dated 2008, on the inside cover. “Tell Me Why,” by Arkady Leokum: Dried flowers and prayer cards for St. Thomas Aquinas, the patron saint of Providence College, and a subscription card for Vanity Fair magazine. “Living Out Loud,” by Anna Quindlen: A photograph of my maternal grandfather and his parents and 13 brothers and sisters. On the back is this: “Tom 36, Curt 35, Ruth, 34, Edith, 33, Arthur, 30, Eva, 29, George, 27, Ray, 26, Bob, 24 (my late grandfather), Roy 21, Lilian 18, Albert, 16, Ma 58, Pa 57. July 4, 1951.” Hard to believe that photo is 57 years old. A Boston tourbook: A $50 birthday check! Eek, good thing the check is only a month-and-a-half old. The messages remind me of my own past, and make me wonder about other people’s pasts. What did Lisa’s message in Joan Didion’s book mean, and who did she write it to? Who wrote on the back of the photo of my grandfather and his family? I usually sign books when I give them to people so that someday, when the novel or cookbook is lying dusty on a shelf in a used bookstore, the message and memories will live on. What have you found in your own books?